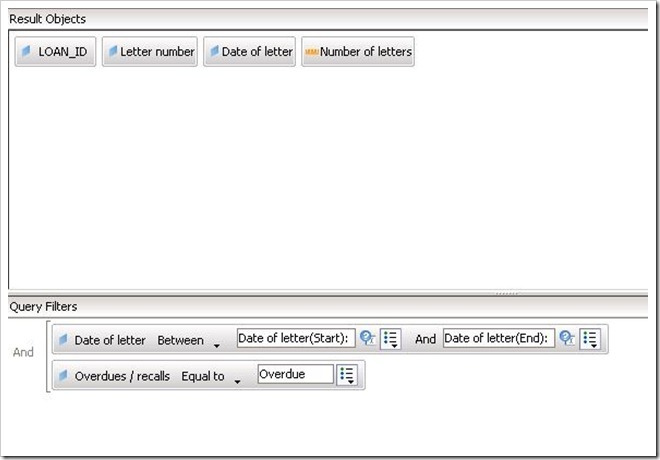 One of the issues that folk sometimes want to check is the effectiveness of their overdue letters: that is what proportion of items are returned following an overdue letter. There are several ways to approach this. Here is one. 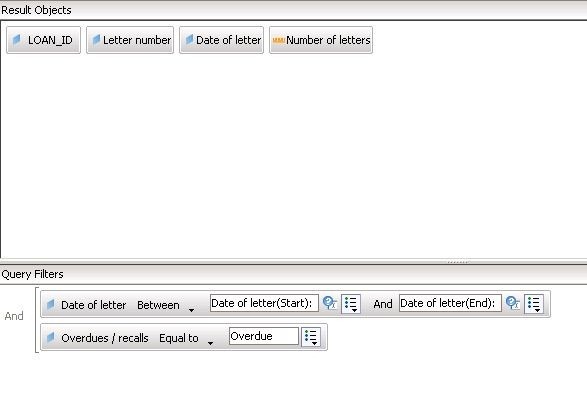 You will note that the letter dates are set up as prompts in this example. 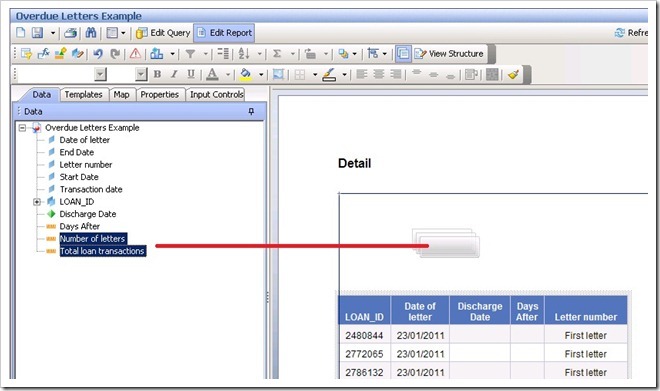 These dates can be selected directly instead, although this means modifying the report whenever it is run. This returns relatively little data. 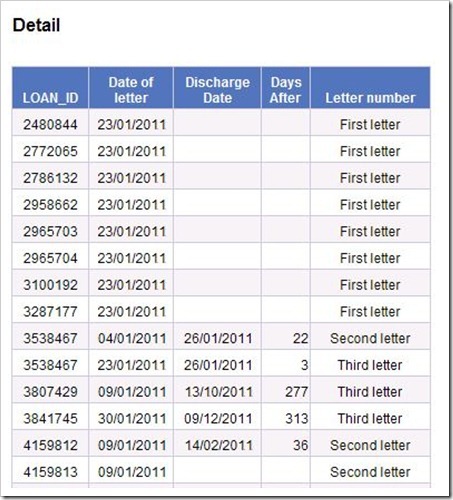 Because it is filtered to return discharges only, if a LOAN_ID is found, then we know that that loan was discharged. The filter uses a sub query. 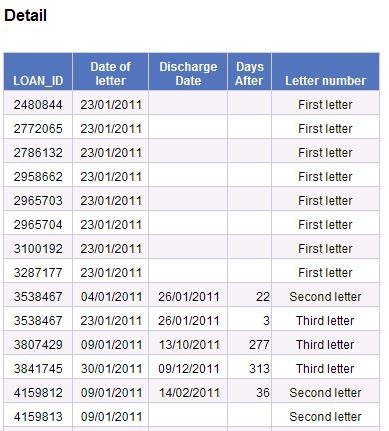 What this says in effect is “go away and find the LOAN_IDs where there was an overdue letter in the date range, then use this list of LOAN_IDs to search for discharges”. 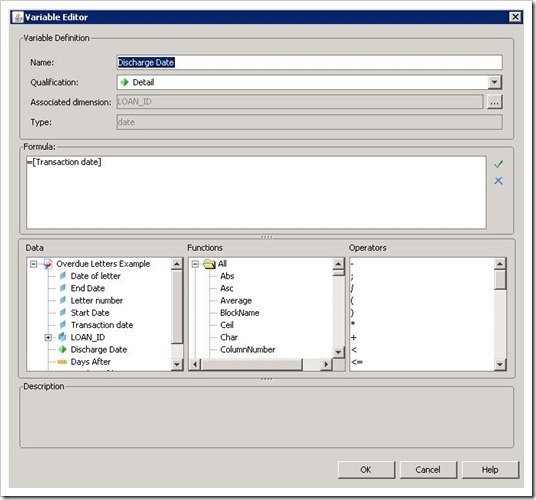 Why not use one query? 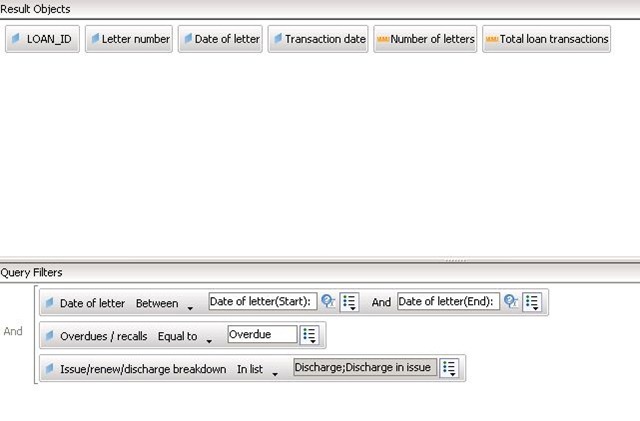 So whilst two queries and a sub query looks complex it is actually the best way to get the data that you want. and the second contains all the loan data. I started by deleting this second (loan data) table completely. You now have the detailed data that you need. Wherever there is a 1 in the last column, that book was returned. If you want to add the date that it was returned to the table you will find that you cannot do so directly. 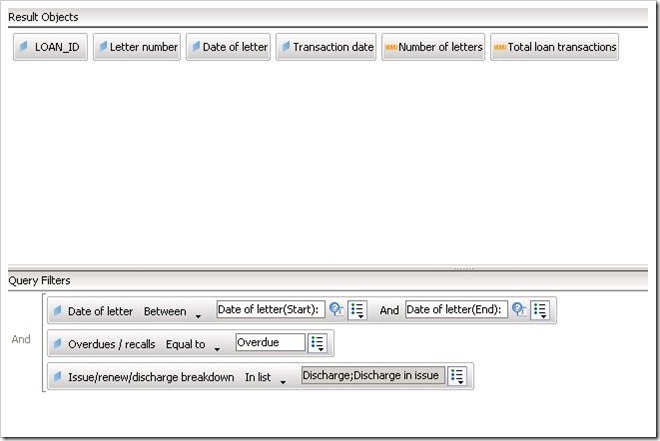 In theory there could be many different transaction dates for a single LOAN_ID (Issue, Renew etc) and Decisions doesn’t know what you do: that there should be just one discharge transaction for every LOAN_ID. You know however, and there is a way of picking Decisions up by the neck and growling “read my lips”. 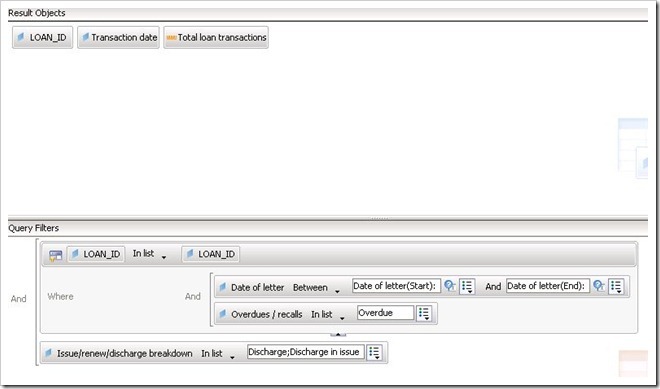 Create a variable (I named it Discharge Date), set it equal to Transaction date and make it a detail of LOAN_ID. 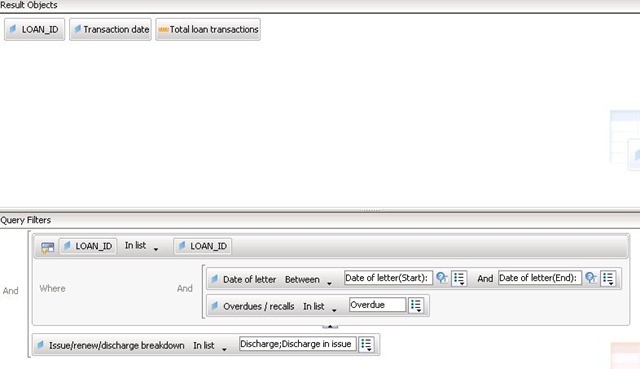 This tells Decisions that there will be just one (or zero) transaction dates for any one LOAN_ID. It will then let you add it to the table. A final touch is to add a summary table. Add a new report tab or drag the main table down a bit and use the space created. 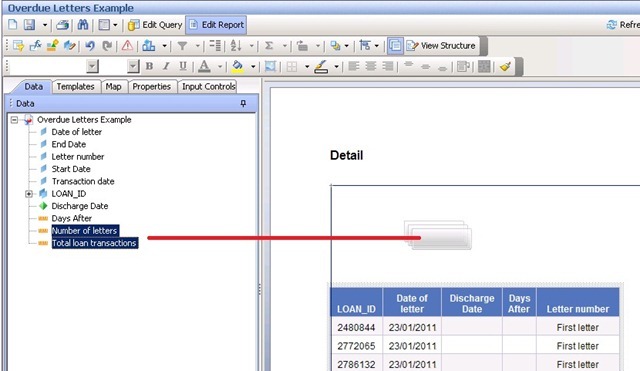 Select (CTRL-click), drag and drop Total Loan Transactions and Number of letters into the report. Many thanks for this. I have attempted to run the report on a few occasions but have had to kill them due to the length of time they are taking (24 hours+). I am attempting to report on overdue letters that were sent during the first quarter of 2012, therefore shouldn’t be an excessive search criteria. I have also attempted another variation of the report that included a filter on transaction dates, however this also took over 24 hours. Obviously this causes a problem as the dump2disk restore isn’t able to run overnight as the db is in use. I have noted that the CPU usage on the MIS server spikes to about 90-100% about an hour into running this report, and killing the report seems to have no effect on reducing the CPU usage. 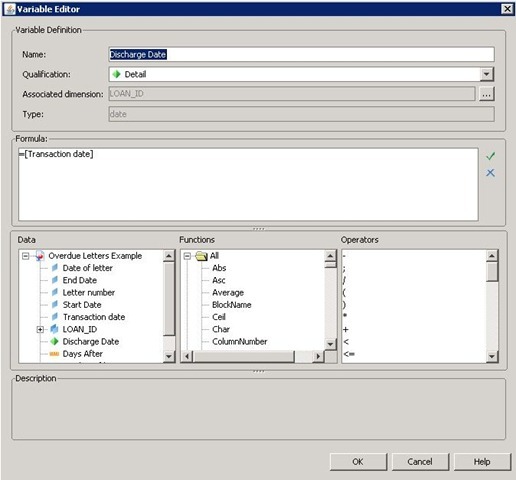 The process is the sybase dataserver. I have an open call regarding this issue as at first I didn’t realise that it may be this report that is causing the spike. Is there any way to further optimise the select criteria?